Mr r, if you get a correct orientation (male/female) adapter you can use the antenna connection on the driver's side of the center console. This is where the Avin avant got its antenna connection. I believe that is the OE antenna connection for the original phone cradle option. But it worked really well on the Avin. Just an fyi. Saves running the antenna all the way to the back. You mean there's a fakra connector in there and that connects it to the car's FM/AM antennas? Yes. Actually, I believe it connects to most of the antennas via splitters, amplifiers, and signal cleaners. 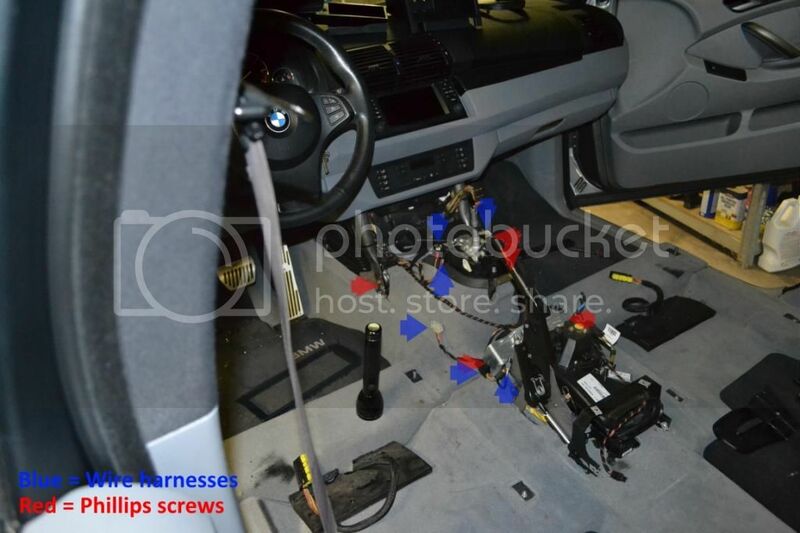 After stripping down the parts car and looking at diagrams it seems BMW uses the same "network" of antennas for most of their communications stuff. The one you want is there by that blue arrow. Another shot... very bottom of the image. Looks like you would need a female Fakra. I may I removed that when I was doing my center console swap as I deleted all the phone prep harness wires. It would still be too short anyways and might as well get the long wires and will just tape them together with the radio harness that has go back there anyways so same PITA. Gotcha. I didn't know what stage you were at with ruining wires. The factory GPS antenna is in the top of the hatch in the removable panel. Was just there looking at it when I swapped my third brake light. Also pulled it out of the parts truck. Same location. They seem similar in specs, so it would come down to deciding if I want the more OE-appearance of the Hizpo or the bigger screen of the Xtrons. I have factory Nav in the back, so I'll need the long cables for my connectors and antenna. Are you guys buying those for $70ish, or are you splicing and extending them yourselves? Is it possible to "fish" the wires under your carpet to get to the back, or is everyone pulling out their interior? I can't help you with what to buy. The specs are changing so quickly that I could justify replacing what I bought just two years ago. I suggest you buy what others are purchasing and from same vendor so you can get help here if need be. It is my understanding that several of the Android based units are the same, built by the same MFG, just branded differently but I don't know which ones. I have the bigger screen and if I were to purchase again I would do so again. Primary reason is navigation is easier to see and I use the Torque app to put a cluster of gauges on the screen. I don't recall anything connecting to the rear nav unit. If it does this routing comes out right there. I'm quite sure I didn't have to purchase anything special because of nav unit. I ran all the wires along the side of the console by just removing the carpeted trim piece then under the carpet that ends under the front of the driver's seat and then just under the edge of the carpet that is covered by plastic pieces to the back. I had to remove the trim between the front and back seats and the trim piece to right of upper back seat cushion. From there you can easily pull the wires into the rear. That was the only fishing I did. I suggest running the harness over the seats first to test everything before the permanent install. I have been happy with my Eonon sold unit but yes, the units are made by others and then "branded" with the seller's software ROM and feature set. I have an Eonon WinCE in my E46 and an Android Eonon in my E53. The Android with iBus app and adapter is the way to go in my opinion. Also, octacore and 4GB RAM gives a very snappy performance on RAM heavy or multiple apps. 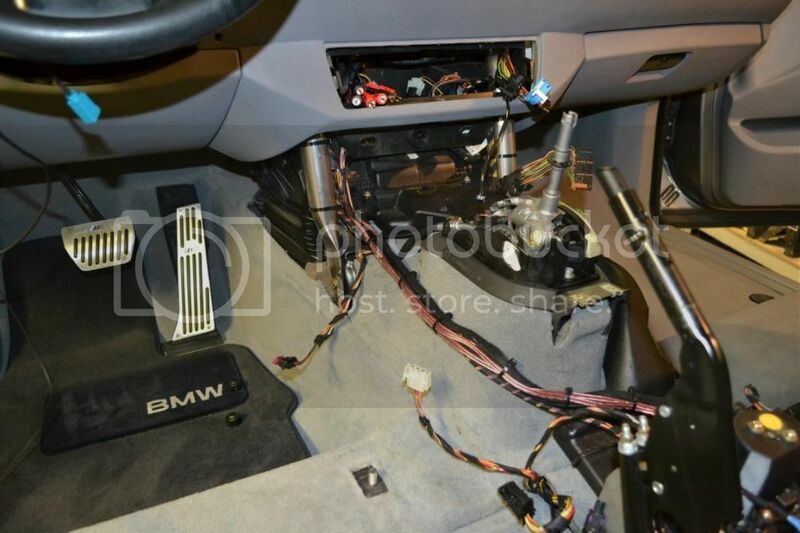 Eonon has for years been very active over on E46 Fanatics and have a member who is a rep for the company answering lots of questions and helping folks with their installs and software bugs. IIRC, Eonon provides the long FAKRA cable for free with their units. This is the biggest pain of the install for factory Nav equipped vehicles, running the cable from the back to the head unit is tedious work. I ran mine along the driver rear side around the base of the rear seat and then under the center console, coming up through the thick foam lined carpet. I second the motion to connect everything up on the tailgate to test prior to full blown install. As mentioned there are tons of brands to choose from. Im partial to Seicane and will stick with them since I have had flawless results with them. I have a few eonon units which work but the Seicane so far I like better than the eonons I bought. But in fairness my oldest eonon is their first unit. Another thing to consider is the build quality of the unit. The off-brand one looked great in the photos but felt extremely cheap on hand and buttons where rattley and clicky. Got the avin 4 and it was more comparable to the oem unit as far as build quality goes.